A Mason-Dixon poll reveals that Florida Gov. Charlie Crist leads a hypothetical three-way race for Senate. Washington (CNN) - Gov. Charlie Crist leads in a hypothetical three-way race for Senate in Florida, a week after he decided to leave the Republican primary and run as an independent. Crist enjoys a six point advantage over Republican Marco Rubio and Democrat Kendrick Meek in a new Mason-Dixon poll of 625 registered voters surveyed by telephone. 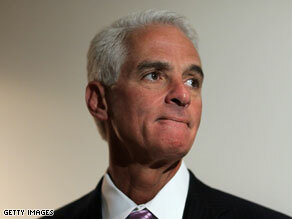 Crist captures 38 percent in the new poll, followed by Rubio with 32 percent and Meek with 19 percent. Crist announced last week that he would run for Senate as an independent candidate, sidestepping a primary showdown with Rubio. The survey shows that Crist enjoys double-digit support from Democrats. The survey's overall sampling error is plus or minus 5 percentage points and was conducted May 3-5. This is a perfect example of why the November elections may not be the "blood bath" for the Democrats that some of the more vocal of the Obama haters hope for. Welcome to the new "silent majority..."
Kind of early to mean anything (polls), but Rubio is a loud mouth parady of the "get tough talk never served (Cheney) politician" and Meek, a good guy in the US House, probably not electable. Crist is by experience, the best candidate and his demeanor in governance and candidacy has been good. You go Charlie! Prove the two-party system is dead! No more bi-partisan – let's make it tri-partisan! I hope Crist wins he is truly a good guy. rubio is a snake in the grass. I would humbly urge those who are supporting Meek to change their mind and support Charie Crist. He has been your governor and you have witnessed what he had done for you. 19 percent of Meek can not pull off the result you are anticipating! It is the reality! These numbers will change by election time..........people don't like sniveling weasels and Crist fits that description perfectly. More and more politicians are running from the dreaded (R) that has become a sinking ship. Its a glorious day in America. As someone with ties to Florida (UCF, Kissimmee), I have long held Charlie Crist in high regard. He is not one of those too-long-on-the-job incumbents who needs to be swept out. He has paid his dues to the state and its citizens, not by staying in one place forever but in winning and holding several complex and important jobs in Florida. Rubio is a nice enough human being, but he is riding a false wave of "anything new is better than anything old." Barely any of that discussion reveals the true Rubio, indeed, the true anyone or anything. Crist deserves our state's support. It is shocking to see what the national Republican party has become this year, bowing in obeyance to Tea Partiers and not even participating in cross-party deliberations. Charlie Crist is not afraid to state his case and stand his ground, nor is he afraid to change his mind to the good should he learn the truth about people and situations-and parties. Vote Charlie Crist, please, for all our sakes. Why intelligent people would vote for Rubio – with his sleazy record in the state legislature, his hand-picked budget officer under indictment & Rubio himself being investigated by the IRS – totally escapes all logic! Notice the GOP ad are nasty & personal: never on the issues: BTW - Rubio declared he was against the AZ immigration law ... now he's for it! Flip-flopper & corrupt before he's even nominated! YES!!! No way-No how-No Rubio! It is going to be very amusing, if he wins, ands beats out the GOP political machine as well as the Dem political machine. Very good news.. This Democrat is voting for Gov. Crist.. to bad Meek..